Sell tickets to your event with Ticketbooth – it’s easy and free! All the tools you need for secure online ticket sales: event pages designed to work great on all devices, powerful cloud infrastructure, and constantly tested security. Ticketbooth makes it easy to manage your event’s online ticket sales from anywhere at any time. Whether you’re running an event for 40 people or 40,000, Ticketbooth gives you the tools and support you need to manage your entire event, from onsite ticket sales through closing. 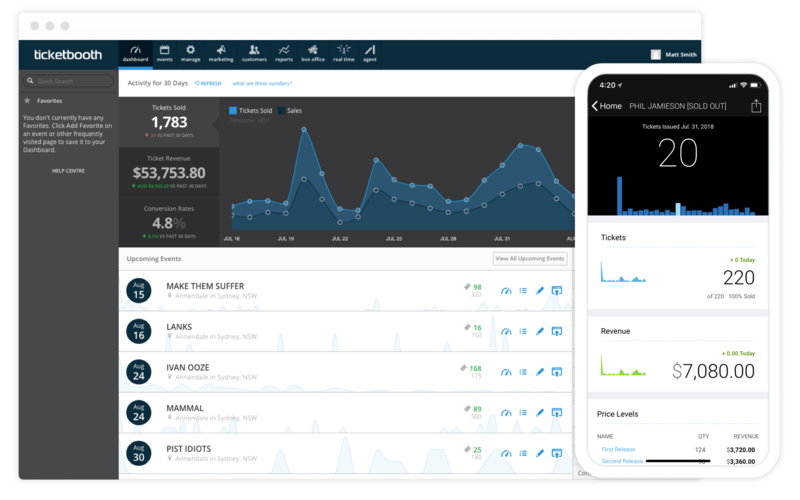 Ticketbooth gives you full control of your ticket sales, from posting events, changing prices and inventories to processing refunds, everything is there when you need it. A simple 3 step wizard allows you to fully create and post an event ready for sales in minutes, helpful notes guide you through the process ensuring everything is ready to go when sales open. Sell tickets to fans with a customisable event ticketing page. Choose your fulfilment type: e-ticket, registered post, or mobile, and start selling. Rest easy with industry-leading security, including full PCI compliance. From lost tickets to event information, our support team works around the clock to help. Offer discounts to groups or families by selling tickets in bundled lots. Sell tickets to your upcoming event directly through Facebook with our integrated app. Powerful tickets sales reports presented in a format you and your team understand. Advanced event marketing technology to help take your event from concept to sell out. 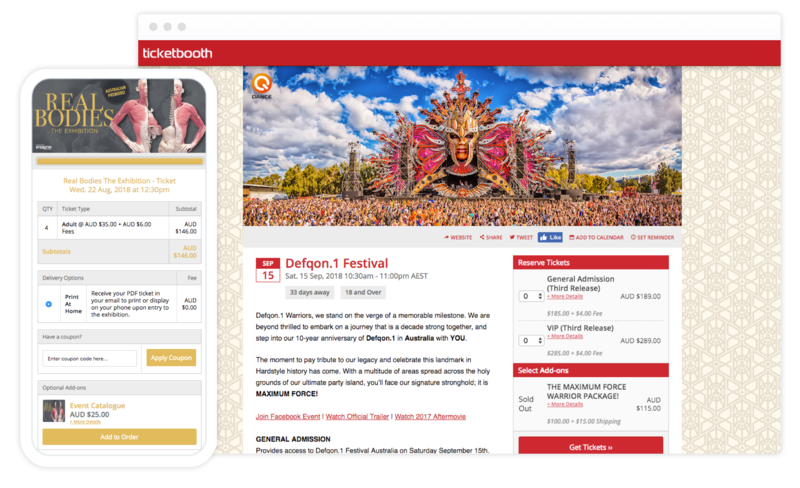 Ticketbooth is 100% web based, which means you can put an event on sale from any device and at any time. Backed by our constantly tested cloud stack, you can rest at ease knowing your events are safe. Make changes to event descriptions or ticketing inventories without pausing or stopping your ticket sales. Perfect for last minute changes or adding clarification to descriptions. Use Ticketbooth triggers to provide automatic time based changes to ticket inventories and pricing. Our template design wizard makes it easy for you to quickly customise your event pages, even if you have no programming knowledge. 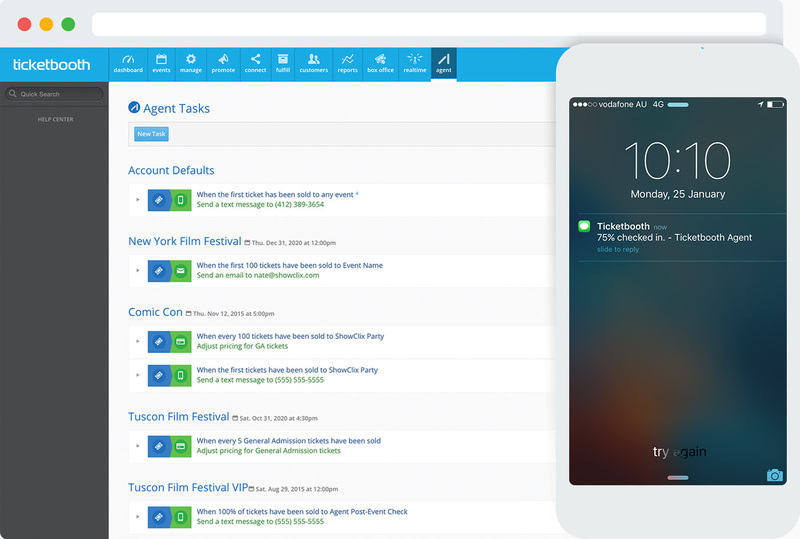 Ticketbooth Automate is a set of tools that allows you to setup a range of different tasks and triggers to help you throughout the day. Increase performance with rules that constantly monitor and optimise your tickets on sale. Find out when there is a spike in traffic to your event pages, or when price levels are selling fast. Receive ticket attendance alerts hourly, or get alerted when ‘John Smith’ has checked in. Setup automated tasks such as hide/unhide price levels, increase price when ‘x’ tickets are sold and more..